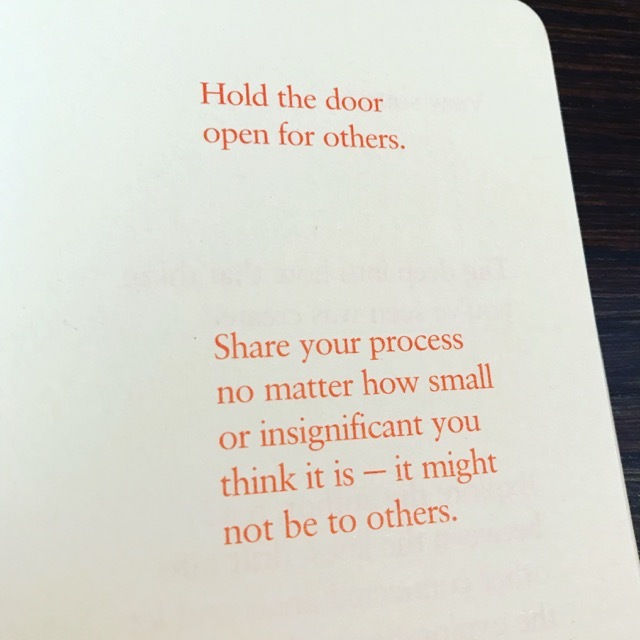 In my new book Notes to Myself, there's a note about holding the door open for others. Whilst literally this is always a nice thing to do, in this instance what I'm getting at here is the importance of sharing the things you learn via this wonderful thing called the World Wide Web, no matter how insignificant you think they may be. This blog you're on right now is an eclectic mix of snapshots of work-in-progress together with often very niche subjects, such as doing a certain thing with Vim or things I've learned in my daily use with Processing. At times I think "will anyone reads this, does anyone care? ", but I always publish it anyway — and that's for two reasons. First it's a place for me to find stuff I may have forgotten how to do. Secondly, whilst some of this stuff is seemingly super-niche, if one person finds it helpful out there on the web, then that's good enough for me. After all I've lost count of how many times I've read similar posts that have helped me out. I do all this on my own site, that I control. Yes I could publish this on Medium, and maybe I should do both and maybe I would get a bigger audience, but one day Medium will be sold, switched off or reach some other fate that I have no control over. I've even had Medium block content that was part of my post. Screw that crap. So I continue to write stuff down on my little corner of the Web (does it have corners?) and I encourage you to do the same, as all these little bits of flotsam and jetsam become something a lot lot bigger.